Once the ad is published, we will call on gold's friends everywhere to ask members of Congress to ensure that GATA's questions are answered. GATA is fighting for the gold cause. If you haven't joined us yet, please do. Gold's enemies won't stop until gold fights back, and they are confident that they have intimidated the whole industry and even the countries whose livelihoods depend on gold. What Are You Doing With America's Gold? On July 24, 1998, before the House Banking Committee, and six days later before the Senate Agricultural Committee, Chairman Greenspan made the following statement: "Central banks stand ready to lease gold in increasing quantities should the price rise." Ever since that comment was made, there has been a growing controversy about whether the Federal Reserve and the Treasury Department have been actively involved in the gold market. There has been speculation that the U.S. government, through your agencies, has been seeking to lower the gold price to rescue certain financial interests, much as the Fed orchestrated the rescue of Long-Term Capital Management last year. Aggressive bullion dealers, hedge funds doing the gold "carry trade," and unwise price speculation disguised as hedging by gold mining companies are most frequently cited as the beneficiaries of this government intervention in the gold price. As with LTCM, there is concern about severe risk to the world financial system, this time because of irresponsible gold lending policies of central banks. "We cannot allow these rumors to grow, because they are extremely dangerous to public confidence. It has been suggested that the market is very short of gold, that the short positions may be a substantial multiple of the total amount of gold currently held by the Bank of England, and that the bank's real motive is to save the bacon of firms that are running those short positions. If such a suggestion is being made seriously, it must be dealt with authoritatively and definitively, and we want an answer from the government now. — Quentin Davies, Member of Parliament"
The Bank of England's announcement collapsed the price of gold from $290 to $252 per ounce. But when, on September 26, fifteen European central banks announced that they would restrict their gold sales and gold lending for the next five years, the gold price soared to $337. Word spread that the bullion banks were panicking again. As if right on cue but in uncharacteristic fashion, the government of Kuwait then announced it was depositing its 79 tons of gold with the Bank of England for lending purposes. There was speculation that the New York Federal Reserve Bank was using all means at its disposal to push the gold price down to accommodate the financial interests that were short gold. The Question Demands An Answer: Is the government of the United States intervening in the gold market and, if so, why? Chairman Greenspan, we will take you at your own word that you are intervening in the gold market as you said you would if the price rose. The Federal Reserve Bank's Open Market Committee may have the authority to deal in gold coin and bullion, but all purchases and sales, according to 12 USC 263-359, "shall be governed with a view to accommodating commerce and business." If, rather, the Federal Reserve Bank or the Treasury Department is depressing the gold price in order to help various and numerous gold short sellers, it is a clear and illegal violation of the bank's purpose clause. The government's intervening to help one side over another in a private contract is illegal, fraudulent and unconstitutional. For the U.S. central bank to use its powers to benefit one class of citizens to the harm of another class of Americans is a gross violation of the Constitution's equal protection clause. If the Federal Reserve intervened in the gold market after the October price rise as you said you were prepared to do, it was not to accommodate commerce and business, but to accommodate one half of the parties to a private contract who had shorted gold. The other half of the parties to this same contract who bought gold were cheated and deprived of a fair market price, denied the equal protection of the law and cheated of profit potential. It would be an illegal and fraudulent act that was perpetrated by bankers who are unelected bureaucrats reigning like tyrants without legal or political supervision. The manipulation of the gold market has caused irreparable harm to gold owners, gold companies and gold miners as well as all Americans. It destroyed a free market, depressed the fair value for an important financial asset, distorted the value of gold companies on the New York and American Stock Exchanges and decreased the value of its own and America's gold assets. The Fed's price fixing action should be investigated by the Securities and Exchange Commission and the Commodity Futures Trading Commission. Indeed, the SEC should be concerned that both the gold market and the stock market generally may be constantly manipulated now by surreptitious government intervention. Whatever the policy and practices of the Fed and the Treasury Department are in these respects, this is a matter of the most profound public policy and it should be a matter of public record. 1. Does the Federal Reserve or the Treasury Department, either on their own behalf or on behalf of others, including other government agencies, such as the Exchange Stabilization Fund, lend gold or silver, facilitate the lending of gold and silver, or trade in any securities, such as futures contracts and call and put options, involving gold and silver? 2. If the Fed or the Treasury Department do lend these precious metals, do they do so only on a swap or repurchase arrangement basis, or do they also lend unsecured? 3. What are the credit criteria that a potential borrower needs to establish with the Fed or the Treasury? 4. What credit limits are applied to borrowers? How do they vary between secured/swap lending and unsecured lending? 5. How often are counterparty positions marked to market in these transactions? 6. What happens if market price movements cause the credit limits to be exceeded? 7. Does the Fed or the Treasury have any counterparty credit utilizations in excess of 90 percent of the limit? 8. Have any precious metal-related credit limits been amended other than in credit limit reviews in the normal course of business? 9. Do the Fed or the Treasury Department or any other government agency ever own or deal in derivatives that are connected with precious metals? Do any of these agencies write call options against the Treasury's or Federal Reserve's gold holdings, or write naked call options? 10. Do the above-mentioned credit limits and mark-to-market provisions apply to derivatives as well? 11. Have the Fed, the Treasury, or any other government agency, either directly or through their management of foreign custody accounts, collaborated with the Bank for International Settlements, the Bank of England, or any other central bank with a view to managing, smoothing, or otherwise affecting the market price of gold? There is also great concern that U.S. gold reserves have been lent or sold. Those gold reserves are a great national financial asset, yet they have not been audited officially since the Eisenhower Administration. So in addition to answering the above questions, we ask you to arrange an independent audit so that the country may be assured that its gold remains in public hands. 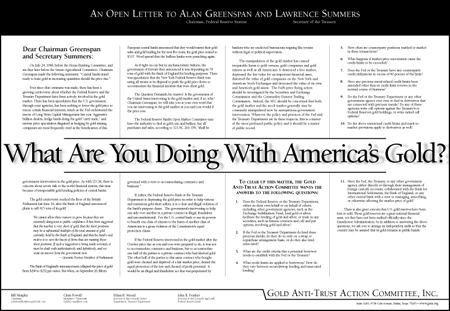 GOLD ANTI-TRUST ACTION COMMITTEE, INC.